Stop Oregon Litter and Vandalism, also known as Solve. 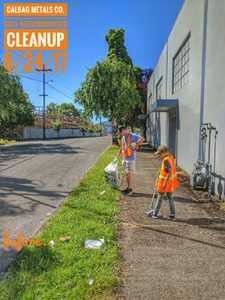 SOLVE Oregon brings community together to clean up the environment and protect it for the future. Gathering early Saturday morning, Calbag employees and their families picked up and collected over 1,200 discarded cigarette butts and 15 bags of litter. Just 4-hours of hard work cleaned the streets of the NW Portland industrial community between the streets of NW Nicolai and NW Thurman, from Highway 30 up to Lower MacLeay. 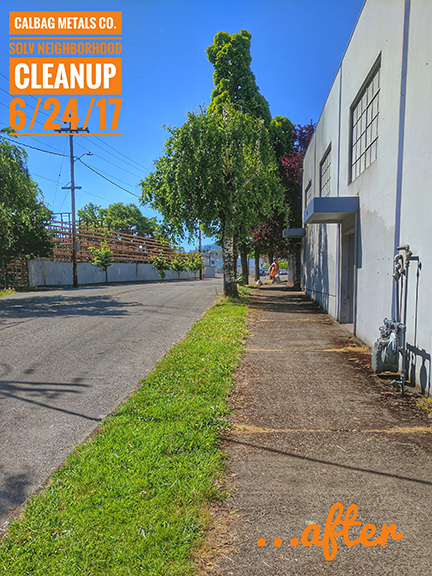 In addition to litter and other types of trash, we picked up discarded larger items that couldn’t be carried and had to be hauled to a collection site. Stop Oregon Litter and Vandalism was created by Governor Tom McCall and other community leaders nearly fifty years ago. If you are interested in getting involved with SOLVE, click here to learn more. Find out more about Calbag Metals‘ commitment to our mission and to a higher standard in the metal recycling industry.